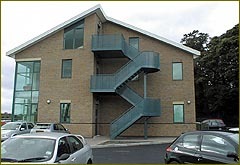 We are a well established manufacturer of a wide variety of steel products including steel staircases/balustrade and handrails to wrought iron railings for both commercial and domestic use. Our flexibility to work to your design gives you the ultimate choice. We also have a wide variety of designs for you to pursue at your leisure and can recommend the best and most practical choice for tour project. Our aim is to provide a top class service at competitive rates and we always aim to work to your time scales. Please do not hesitate to contact us if you have any questions about the work we can do, as the variety is virtually endless. If you can draw it, we can make it. Here is just one of the many external staircases we have designed and manufactured, we offer a full fitting service so that you have total peace of mind, knowing that the job will be done properly from start to finish. 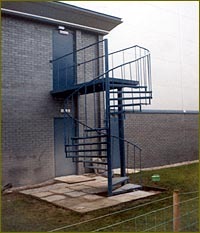 This staircase covers four flights and is suitable for heavy emergency use. Finished in galvanised mild steel. 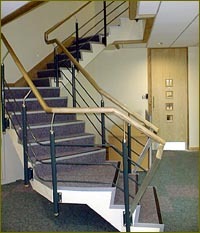 All staircases can be designed to meet your needs. Here is an excellent of our spiral staircases. An excellent space saving staircases with a pleasing overall look. For external or internal uses and in a variety of finishes. This is one of our most popular internal balustrade and handrail designs. A combination of powder coated mild steel with a stainless steel and ash wood handrail. Ideal for any office or reception area finished to the highest standard. (Other types of wood can be chosen). This is just a brief sample of the wide range we cover in staircases and balustrade/handrailing. The vast experience that J.Battersby Engineering Ltd have gathered means that we can accommodate virtually any design or project and give satisfaction time after time. If you have any questions please do not hesitate to contact our trained sales team who will be able to advise you on any queries you may have. If you wish to e-mail us please click on the address below.